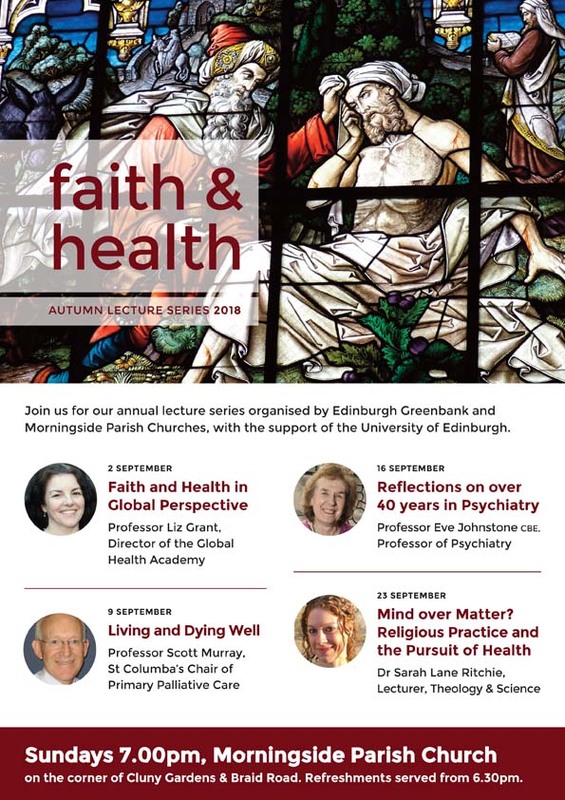 The following was published as a leaflet in Autumn 2018: Explore Faith and Life at Greenbank [pdf]. Welcome to our autumn programme of opportunities to delve deeper and to explore faith in the company of others and in your own time. We hope you’ll feel welcome to be part of anything that appeals to you. Why not try something a bit different, and see where God leads you? 7th & 21st October, 4th & 18th November, 2nd December; 2019: 20th January, 3rd & 17th February, 3rd March. Youth Alpha is a chance for people with no church affiliation to talk about the ‘big questions’ of life, and see various answers Christianity has given to those questions. Pizza to be provided, with a short video to get us talking about the topic for the evening. Contact Steve Chaffee to register. Join us when you can! On Sundays at 10.30am: 2nd, 9th, 16th, 23rd & 30th September. • Survival of the fittest? After each service, we’re invited to grab a coffee and come back into the sanctuary to discuss the themes and to engage with the visiting preacher. At Morningside Parish Church on Sundays 2nd, 9th, 16th & 23rd September at 7pm; refreshments from 6.30pm. together, followed by refreshments. We are exploring aspects of prayer, using as a guide Prayer – An adventure with God (Scripture Union). All are welcome! For further information contact Joan Ritchie or Gillian Sweetman. Wednesdays at 1pm from 12th September. From Wednesday 12th September there will be a 20-minute reflective service, at 1pm, in Greenbank Church (Braid Room). Everyone is welcome to share in this. On selected Monday evenings from 1st October through the Autumn and Spring, meeting in the Hermitage Bar for food (if you wish) from 6.30pm, then informal discussion of the week’s themes from 7.30pm. Contact Steve Chaffee or Martin Ritchie for details. Our Minister was a choir director in a previous life, and is dusting down his baton to create a special community choir, which will lead a magical service of music and readings on the evening of Advent Sunday (2nd December). Rehearsals are on Sundays 28th October, 4th, 11th, 18th, 25th November, 4pm–6pm in the church. Everyone is welcome, both experienced singers and those keen to have a go! Contact Martin Ritchie to sign up or for more information. At 6.30pm–8pm on Sunday evenings from 28th October to 9th December (omitting 2nd December). We are offering anyone interested a selection of approaches to explore contemplative worship. We will start with a short teaching session, give everyone a chance to identify problems or difficulties, have a short break and then offer some guided practice. We’ll be looking at using bible reading for prayer, imagining being involved in biblical scenes, using images as a way into prayer, experiencing Christian meditation and learning how to recognise God in our everyday lives. For further information or to register, contact David Allan. Join us at 7pm–9pm in Greenbank Church (Braid Room) on Wednesday evenings from 7th November. We’ll have a coffee and chat about one of G.K. Chesterton’s thought-provoking Father Brown detective stories. The story collection, The Innocence of Father Brown, is available from Waterstones, from www.amazon.co.uk, or from www.gutenberg.org (free) as an eBook. From this collection, on 7th November we’ll discuss The Blue Cross, on 14th November The Eye of Apollo, and on 21st November The Hammer of God. Contact Steve Chaffee for more information. In weeks beginning 3rd, 10th & 17th December. During the Season of Advent we’ll be offering the chance to join a number of small groups meeting in homes across the parish and hosted by members of the congregation. These relaxed groups will focus on the compelling and accessible book, The First Christmas, by Marcus Borg and John Dominic Crossan. It explores the Christmas story in all its rich layers – not just shepherds and angels, but a lot more besides! During the weeks of Advent, there will be groups on Monday to Thursday evenings, and a daytime group at the church on Wednesday afternoon at 2pm. Details will be on the Greenbank website in the Autumn. Sunday evenings in the Spring. In the Spring we’ll begin a series of evenings designed to allow you to explore faith towards making a commitment to Christ. If you’ve never been baptised, then this could be the outcome of the programme. If you’ve been baptised before, then Confirmation or Profession of Faith would be the next public step. These evenings will explore the big questions of faith, some of the key ways in which the Church has come to respond to them over the centuries, and what it all means for us today. Details will be on the Greenbank website in 2019.